The 3D within this game looks fantastic, and is similar to looking into a diorama with the 3ds screen being your window into this world. Your character is within the center of this 3d world and objects have great 3D depth distance and fantastic pop-out 3D depending on the environment and situation. The game nativity has 3d environments and the stereoscopic 3D only adds to the immersion of this game's world and characters. This game uses the same 3D graphics engine that was present in the previous Zelda 3D re-release of Ocarina of time. If you have a circle pad pro accessory or New Nintendo 3ds you have direct control of the camera and it makes this world viewpoint easier to navigate and more interesting in 3D. It's very satisfying to move your character and see something in the distance comes closer to you both in game and via stereoscopic 3d. This game is a fully realized 3D game and the 3D graphics are impressive and fit the game like a glove. The game looks sharp and vivid in 3D but the 3D isn't perfect as the problem with ghosting double images happens. This problem with double images happens when contrasting colors cause issues with the eye. This issue cannot be fixed because it’s fundamental flaw within the 3ds hardware and the game’s ghosting can become distracting. Once you start playing this game in 3d for any substantial amount of time you may find difficult going back to playing it in 2D. This 3D is one of the best examples of making 3d work well in the gameplay. When you think of a Legend of Zelda video game what do you think of? The character of Princess Zelda herself? The Triforce? Gannon? The Master sword? Except for a very minor cameo from Princess Zelda this game has none of those things. In fact I would have no problem if this game wasn’t part of the Zelda universe because it might make people more confortable with the games concepts and stop the endless comparisons to other Zelda games. This game is very strange, dark and has gameplay elements that are totally unique and unlike anything else within the Zelda franchise or any other video game for that matter. In this game you play as Link and suddenly find yourself transformed and in a strange world of Termina. Termina has a major problem; the moon is going to crash into the world in three days. Skull kid is wearing majora's mask and has caused many strange and unfortunate things to happen to the land of Termina and it's residents. To help stop the moon from ending the world and stop skull kid you must travel in each cardinal direction and save that area. As you travel across Termina you will meet several characters gain masks, gain items and abilities to help you save the world from the impending doom. The Legend of Zelda Majora’s Mask 3D is a remake of game that originally released in 2000 on the Nintendo 64. I have played the original game, the re-release on the Nintendo GAMECUBE and finally this 3D remake for the Nintendo 3DS. I have always enjoyed my experience with this quirky game. The setting has many dark undertones with death being a central theme. The reason why I enjoy this game so much is because the characters within the game are so engrossing and the gameplay is fun and unique. One of my favorite aspects of the game how it presents the characters, Termina and the citizens almost seems like living breathing world. This living world of Termina does not compare to other modern open world games like Grand theft Auto 5 but it works well. The characters in Termina run errands, walk around the town, and have more depth and are rich with personality. Many of the characters are touched by death and tragedy and saving them is deeply satisfying because of the darker more mature tone. I don’t want to spoil any of these character moments but the game is filled with somber and touching scenes. The story telling is simple with very little dialog and no voice acting yet is presented in a memorable and captivating fashion. Masks play a key role within the game and it almost becomes a secondary currency as you gain masks for specific purposes and one can lead to another. Most of the masks are gained by helping out the various characters with many story and side quests within the game. Many of the masks give you powers and abilities you don't usually have; for example if you wear bunny mask your character will run quickly like a bunny. The three most important masks within the game are the Zora mask, Goron mask and Deku mask. These masks transform the player into a different race/species with distinct abilities. The deku mask transforms you into a small plant creature, which allows you to enter specific crannies that jet you into the air, which allows you to float for short distances. The Goron mask turns you into a large rock creature that allows you roll around as a ball. Finally the Zora mask transforms you into a medium sized fish creature that allows you to easily swim. When you wear a mask the various characters in the game will treat you differently and have different conversations with the player. Some characters will be rude or friendlier to a specific race. I think the game hits the perfect balance regarding race relations and is a very subtle criticism of racism in general. Multiculturalism can truly save the world of Termina. Can you unite all the races and save the world of Termina in three days? The three-day cycle is a major part of the game and even has a counter that is constantly counting down to the inventible destruction of the Termina by the moon. It's impossible to complete the game within that three-day time frame on your first try. You will need to time travel back to the first day to start the cycle over on several occasions as you attempt to save Termina. When you travel back to the first day the events you have done will be reset, but any weapons or songs you collected will travel with you in the new attempt. When you return to the first day certain disposable items will vanish from your inventory. For example the bow is a weapon that will carry over, but the individual arrows are disposable and will not carry over to the next run. A banker is in the game that allows you to save your money will carry it over regardless of the run. Is this a subtle reference to capitalism and the bankers always finding a way to survive? The economy system within the game is somewhat broken because treasure chests that contain large amounts of rupees (currency) will refill in each run. So you can easily cheat the system and gain large amounts of money without much effort. The three-day system is very interesting in other ways because the various story events will happen again in new runs of the game. At times I question the notion of free will because of this game as the characters do the same thing during the three days and the events unfold exactly the same exact way. If somebody looped my life for three days will I do the same thing again and again? For example on the second day it will rain in the city of clock town, this will happen every single run of the game and nothing can be done to change it. The three-day element is interwoven into the many side quests as certain story events only happen on specific days and certain times. The game manages all the various side quests and story missions in a guide called the bombers notebook. This notebook system can get in your face at times, but I like the amount of information that is provided to the player and how you can set reminders for yourself. The overall presentation of bombers notebook is very handy and is automatically generated as you play the game. This game is loaded with characters to help with many side quests, and a majority of the side quests are optional yet beneficial to the player. Some side quests weave themselves back into the main story and help fill the gaps in the narrative. The game really pushes you to accomplish all the side quests so you can gain more information and motivations of the many characters. You may have to pick and choose what characters deserve a happy ending, and which don’t deserve your time because you simply don’t have enough time to accomplish everyone’s side quest within the three day cycle. The three days cycle can be micromanaged by the player by the element of time travel. This ability to time travel and manipulate time is a crucial aspect of the game. You can slow down the passage of time, travel into specific hours into the future and as mentioned previously travel back to the first day. You cannot repeat a day; you can only travel back to the first day so you can’t redo the third day or second day without traveling back to the first. This manipulation and control of time is important for several reasons. Slowing down the flow of time can help the player accomplish key aspects of the game by limiting some of the pressure. Even with the ability to slow down the flow of time the clock will continue to count down to the destruction of Termina. Time traveling into the future will help the player accomplish goals and side quests that are dependent on specific time frames. You can time travel to the future in increments of an hour. Playing specific songs with the ocarina of time controls the element of time travel within the game. Your ocarina is a key item within the game and you will learn new songs that will help you save Termina. Playing your ocarina is a simple process of reading the notes on the screen and pressing the corresponding buttons. You can easily view the songs you collected on the bottom screen so playing the songs is a breeze. Regardless how you manage your time you simply don’t have enough and this element of dread causes stress and anxiety to the player. 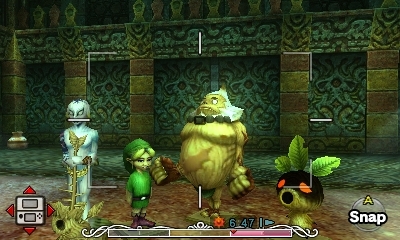 The game will actually show you a apocalyptic video if you fail to save Termina. I really enjoy having this pressure being placed onto the player because it forces you to play the game in a different way and is a tangible consequence for failure. You need manage your time wisely and endless procrastination is simply not an option. I understand some people want to play videogames leisurely and find it difficult to enjoy this game because the pressure to save Termina in three days can be overbearing. I find the time management aspect of the game to exhilarating, fun and unique. The sense of accomplishment is more present because of the limited time and it feels more immersive because of the three-day limitation. Within the game you have many save points all over the world of Termina. Having so many save points does alleviate some of the stress of the game. Compared to other Legend of Zelda games this game has very different gameplay and is a shorter experience. The game has five distinct areas including the main town. Each area has distinct characters to talk to and potentially new enemies to battle. The game has four dungeons to conquer that are mentally challenging and vary dramatically from each other. I found the water temple the most tedious of the four dungeons. This dungeon requires to the player to swim around and change the water height at several locations, and it can become confusing to navigate. Each dungeon has a distinct boss character to defeat and mini bosses to battle. Overall the world of Termina is diverse with many interesting areas to explore and many memorable characters to interact with. It may seem like a small adventure with only four dungeons but the game is dense and never outlasts its welcome. The world of Termina feels lean and tight with no real padding or fat within the game. The game has some key differences from the Nintendo 64 original that I must discuss before wrapping up this review. Swimming as the Zora and rolling as a ball as a Goron are different from the Nintendo 64 version of the game. I think the changes to the gameplay are made for the better and make a more balanced game. The bombers notebook I mentioned before is much more detailed than the Nintendo 64 original. The graphics are vastly improved from the Nintendo 64 original, with many subtle details that give the environments more personality and dramatically improved character models. If you play the game on the New Nintendo 3DS or using a circle pad pro accessory you have full access to use the move the camera. I played about half the game on the original 3DS and half on the NEW 3DS and I enjoyed having camera controls but the default camera controls are completely serviceable. I am slightly disappointed that the extra LZ and RZ shoulder buttons are not used for items on the NEW 3DS; they only mirror the input of the L/R buttons. Regarding the controls I had no problems playing this game, and the use of the touch screen makes inventory management simple and intuitive. The Boss battles have been altered and are different from the original game. The boss character weak points are made more obvious within this game. This change makes the boss battles easier, and sadly makes first major boss is a little too easy now because of this change. I actually appreciate this change because the battles were vague before and this alleviates some of the previous boss battle frustration. This version of the game does add fishing ponds that were not present in Nintendo 64 version. The fishing element is simple and strait forward and fun diversion that adds little to the game. Overall Majora’s Mask 3D is only a refinement of that original game. All that being said I still think this 3D version is the definitive version of the game. After 15 years this game holds up beautifully with tight fun gameplay and characters and scenes that are memorable. The issues I have with the game are so minor that I cannot discount any points. The Legend of Zelda Majora's mask was a wonderful game when it released 15 years ago and it has only become better on the Nintendo 3DS. I might be reading too much into the game but I love how it subtly comments on the ideas of racism, what is free will and the notions of death. I feel this game handles mature themes perfectly yet is appropriate for younger gamers to enjoy too. I really got a wonderful sense of satisfaction replaying the game and reentering and saving the world of Termina. Do not miss this game; it’s truly a bizarre masterpiece and is totally worthy of your time and money.